Recent trends in radionuclide therapy with radiolabeled antibodies and boneseeking radiopharmaceuticals have promoted renewed interest in providing more accurate radiation absorbed dose estimates. A wide range of radionuclides (Table 1), attached to a variety of targeting agents, have been used in these trials. For many of the protocols, radiation absorbed dose estimates are relied on to decide whether a patient should proceed to therapy and for prescribing the amount of activity that should be administered. The motivation for this primer is the provision of absorbed dose estimates for individual patients within the limitations of the associated methodology. Although the MIRD Pamphlet 11 S values (Snyder et al. 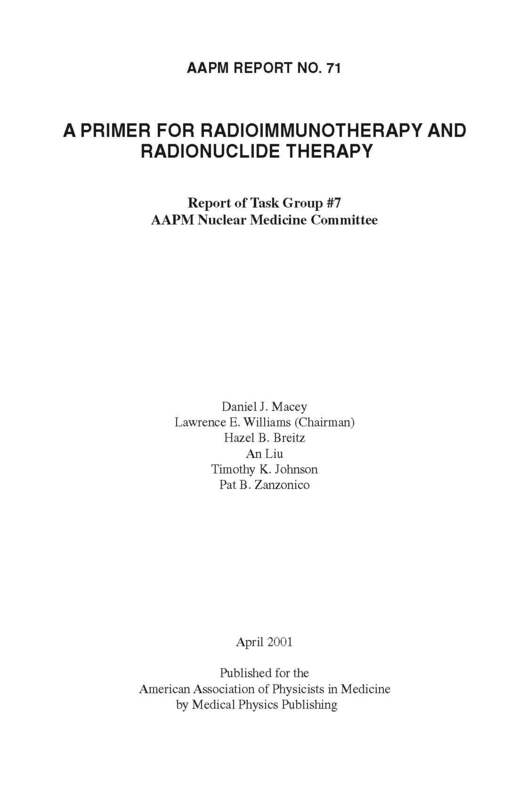 1975) have been used to provide the framework for radiation absorbed dose estimates for patients undergoing diagnostic studies with radionuclides, more accurate methods are required for radionuclide therapy procedures. Here, the organ volumes and geometry of standard man models may not apply. More accurate dose estimates for each patient are also important for establishing fundamental dose-response relationships for toxicity and efficacy of Radioimmunotherapy (RIT). This primer introduces various approaches to internal dose estimation in a therapeutic context. The methodology may also be applied to diagnostic dose estimates. The primer is intended for clinical physicists, radiation oncologists, nuclear medicine physicians, dosimetrists, nuclear medicine technologists, and other hospital personnel who are or will be involved in the process of acquiring and processing dose estimation data.